Change in nose shape is a cosmetic reason that causes most concern regarding appearance. This can sometimes include psychological disorders. The nose takes its shape later in life, usually coinciding with the beginning of adolescence which is the moment when aesthetic problems are the most difficult to accept. Rhinoplasty is a surgical intervention aimed at correcting nasal distortions by changing its shape, bringing improvement to both the balance and harmony of the face. It is one of the operations that plastic surgeons perform the most often. The function of the nose as a respiratory organ is of great significance. The surgeon must keep in mind at every moment and consider both function and appearance as being inseparable. If there are breathing difficulties, the same surgery can be performed. There are two ways of accomplishing this intervention. Closed rhinoplasty: The operation is carried out through incisions inside the nostrils in such a way that no scarring is visible from the outside. By going through the interior, the surgeon can sculpt and model the nasal bones and cartilage in order to form a new shape. In this way, the skin and mucous membranes retract and adapt to obtain this desired shape. Open rhinoplasty: This surgery is for those cases with much greater difficulty like changing large distortions on the tip of the nose. The surgeon directly accesses the structure of the nose through small incisions at the base of the columella, leaving practically unnoticeable scars. Ultrasonic Rhinoplasty: https://www.clinicaplanas.com/jorge-planas/2018/03/07/rinoplastia-ultrasonica/ + Video Nuevo This innovative technique was brought to Spain by Dr. Jorge Planas. It consists of using an ultrasonic device that maximises the precision of the intervention and allows the smoothing and fracturing of the nasal bones without damage to the soft tissue or blood vessels. In this way, no bruising is caused, substantially reducing any post-operative discomfort and avoiding uncomfortable plugs. Augmentation rhinoplasty: Rhinoplasty is not always a reductive surgery. Some patients need to increase the size of their nose in order to accentuate the tip, to restore dorsal height or to correct congenital or traumatic deformities. In these cases, the surgeon usually resorts to grafting tissue from the patients themselves in order to reshape or support the nose. 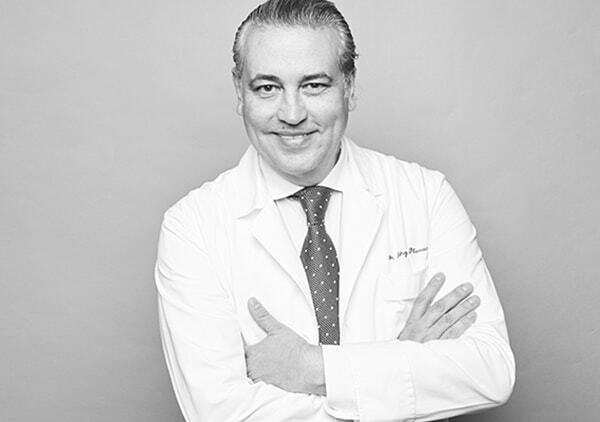 The skin regeneration technique, invented and published by Dr. Jorge Planas, is very useful in correcting noses sunken by trauma, previously unsuccessful surgeries, Asian noses, or simply for low bridge noses. Using INTEGRA dermal regeneration https://www.clinicaplanas.com/jorge-planas/2008/10/26/utilizacion-de-integra-en-rinoplastia/ in rhinoplasty helps to generate a much thicker dermis to aid in reshaping the nose, increasing the size and/or modifying the naso-frontal angle. The advantage to this technique is that it does not use any synthetic material and avoids using cartilage taken from the ear or ribs to reach the same objective. Short nose: https://www.clinicaplanas.com/jorge-planas/2016/04/06/rinoplastia-alargar-una-nariz-corta/ Occassionally it is necessary to graft cartilage from the patient themselves to lengthen a short nose. Every rhinoplasty case is different and must be evaluated thoroughly. It is not only a question of reducing or augmenting the nose size, but also adapting to the facial features and characteristics of each person. In this type of cosmetic surgery, discussions with the patient are especially important in order to meet their wishes and expectations, with the possibility of improving the intervention results. The patients will be admitted in the morning, the same day as the surgery, and will be discharged in the afternoon or evening. It is not necessary to spend the night at the clinic. The rhinoplasty surgery can be performed either with general anaesthetic or local with sedation. The results of rhinoplasty surgery are a grateful and satisfied patient, who quickly adapts to their new appearance and, at the same time, increases their self-confidence and self-esteem. As well as playing a key part in facial aesthetic appearance, the function of the nose as a respiratory organ is of great significance. Breathing will improve if the patient has also been operated on due to breathing difficulties (septoplasty, turbinate...) as well as for cosmetic enhancement. Just like with all interventions, the pre-op medical exam is indispensable in order to detect any possible anomalies that could contradict the operation. The skin on and around the nose must be free from any inflammations or infections and, logically, the patient should be cured of any possible cold or catarrh that cause nasal congestion. At the end of the operation, the patient will leave the operating theatre with a light nasal plug and a splint that covers the nose. During the first few days, you may experience swelling and bruising in the areas around the nose, especially the eyelids. The nasal plug can be removed on the third day. The plastic splint that covers the nose can be removed on the sixth day. Rhinoplasty post-op is usually painless and in general no painkillers are needed. If you need to sneeze, do so with an open mouth, letting the air come out freely. When the splint is removed, the swelling and bruising should have already disappeared and your nose will be in optimal conditions so that you can continue with your normal life. However, the final aesthetic appearance will take no less than six months after to appear. It is slow, progressive and may even pass unnoticed. However, we must insist on how important this is for the final results. How old do I have to be to have the operation? When ossification (bone tissue formation) has finished in the facial bones which normally happens between 15 and 17 years of age. Nevertheless, it is always better to wait until the age of 18 before making the decision to operate. No, it does not. Normally, no painkillers are needed. What are the risks involved in the operation? Possible complications are very rare in this type of intervention. An infection may be caused or more nose bleeds than usual, an abnormal reaction to the anaesthesia, or little veins may appear in the skin on the nose which are generally only temporary (very rare complications, but they may appear in any surgical intervention). Can a patient breathe through their nose? For the first three days of surgery, a small sponge plug must be worn and breathing has to be done through the mouth. Once the plug has been removed, you can then breathe through your nose, although this may be difficult at first as small crusts may have formed inside the nose and there may be unavoidable post-surgical inflammation. When will the final results be seen? Once the dressing is removed after ten days, your nose will be correctly shaped and rather attractive so as to be able to live a completely normal life. As for the specifics, the final results will need more time, in general around six months. You should avoid sun exposure for the first two months after surgery. The area which needs the most protection from the sun is the lower eyelids and if they are exposed to the sun and have any bruising, dark marks can be left in the skin which will take time to disappear. Even though it is not visible, swelling produced by the operation remains for a long time. This is very noticeable when wearing glasses as a deep mark is left at the resting point on the nose. There is no contraindication, however it is recommended not to wear glasses for long periods during the first month after the operation. With some of my patients that I often see, either as friends or professionally, I have observed many times that after having rhinoplasty done, they experience a real and positive change in the way of looking at life and the level of their own self-confidence rises considerably. The results are very gratifying and the best cosmetic surgery helps the patient to forget their previous appearance quickly.